I’m afraid to say “taste the rainbow” here, in case Skittles reads this and sues me for trademark infringement. But really, today we’re tasting the rainbow – nature’s rainbow, not the artificial ones created by companies like Mars, Inc. Sorry, Skittles. I don’t mean to hate! Is this not the most colorful dish you’ve ever seen? When I was editing the picture, I practically had to squint my eyes, the screen was so bright and vibrant! Okay, maybe that’s an exaggeration, but it’s pretty stunning. For weeks, I passed the purple and green heads of cauliflower and didn’t think to pick them up. They looked pretty, but I thought, how weird – kind of like green eggs and ham. It’s just odd? Forget that! The more colorful, the better. Not only is this dish impressive, delicious and vibrant, it’s packed with heart-healthy nutrients. 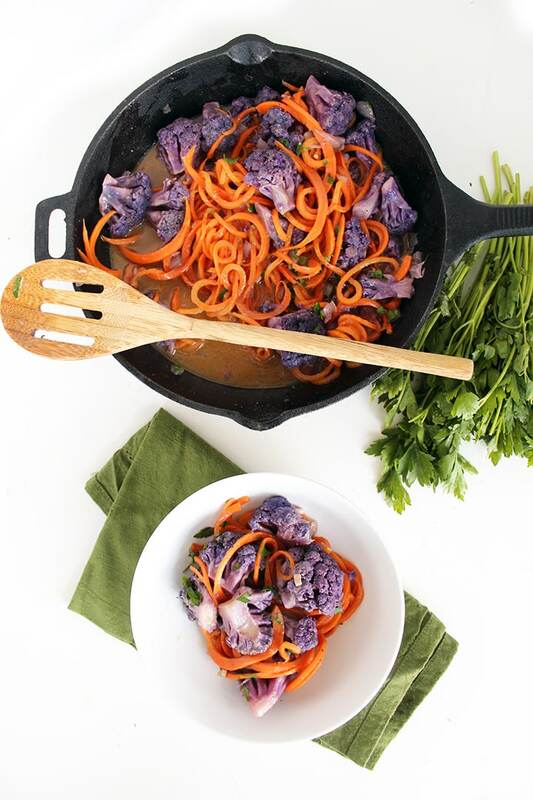 The coconut greek curry taste is luscious as you fork the velvety purple cauliflower. Each bite comes with a slight bit of sweetness from the bright orange carrots, which is divine. Contains chlorophyll, fiber, folate, calcium and pretty much all the other good ones, aiming to reduce cancer risks, normalize digestion, support retinal health and boost the immune system. Contains lutein, resveratrol, Vitamin C and other nutrients that boost the immune system and mineral absorption and fights inflammation. 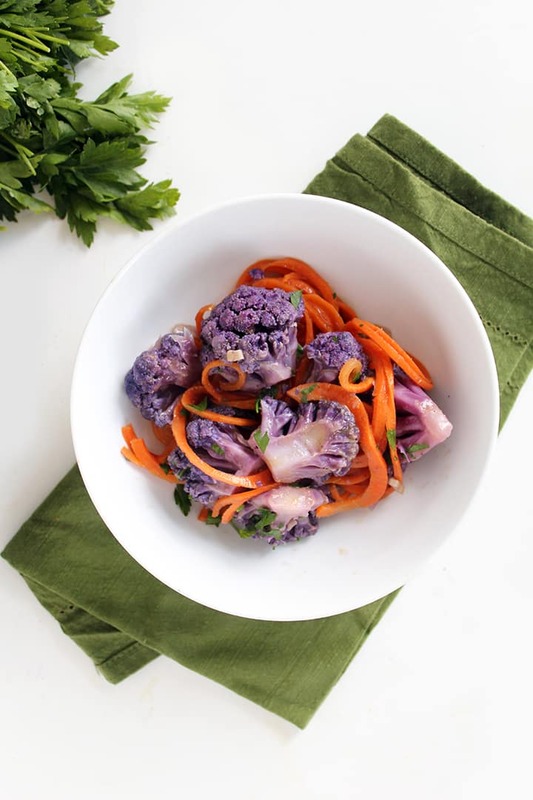 All of the above would mean that, based on the colors of this dish, this meal is packed with beta-carotene, potassium, Vitamin C, lutein, resveratrol, fiber, folate, calcium and many others. 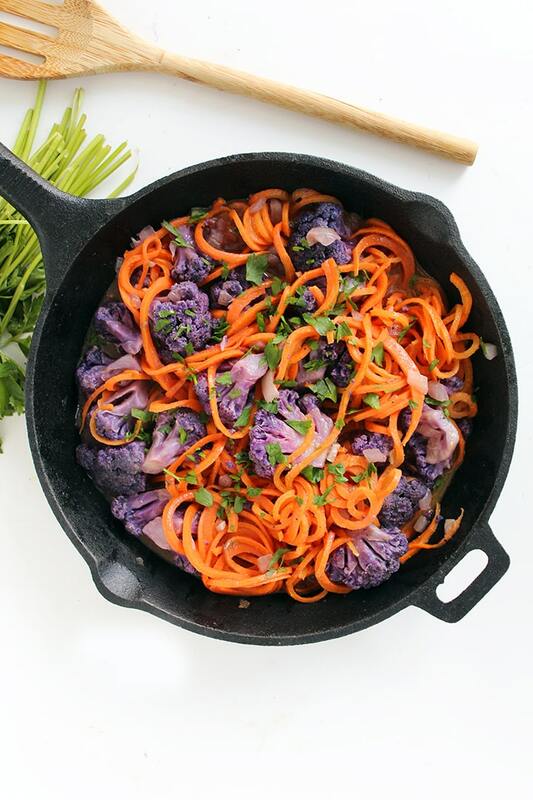 Next time you see a purple cauliflower at the supermarket, farmer’s market or in your CSA box, don’t avoid it like you would with green eggs and ham. Embrace it’s beauty and make this yummy curried. 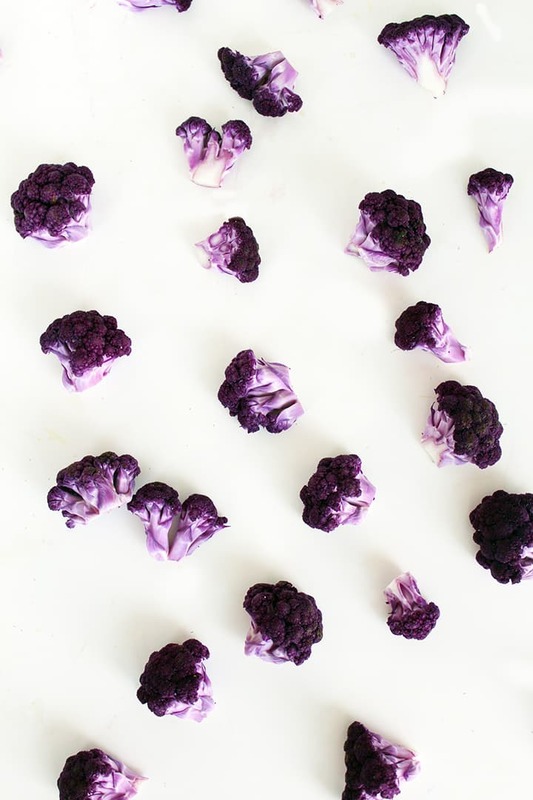 FYI – the purple color in this cauliflower is caused by the antioxidant group anthocyanins, which is also found in red wine and cabbage. Not too shabby, my friends, not too shabby. 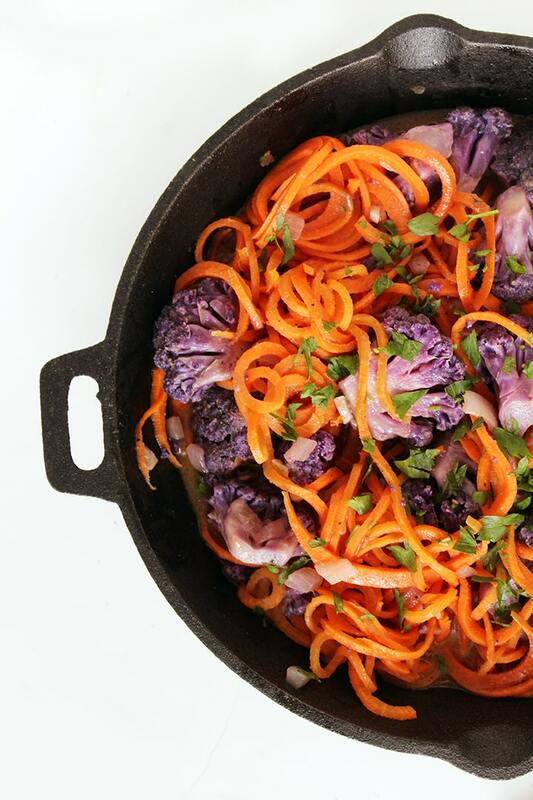 Meatless Monday has never been this gorgeous! 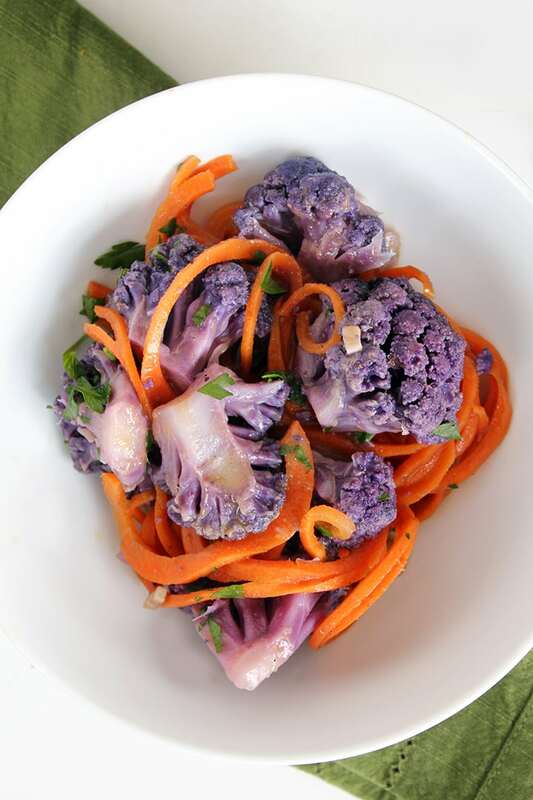 Have you ever tried purple cauliflower before? Bring a medium saucepan halfway full of water to a boil. Once boiling, add in the cauliflower florets and cook for 2-3 minutes or until more easily pierced with a fork, but still slightly tender. Drain into a colander, pat dry and set aside. In a large saucepan, heat the oil over medium heat. When the oil heats, add in the onion, garlic and ginger. Cook for about 3 minutes or until onion becomes translucent. Then, add in the curry paste and stir continuously until paste covers the onions. Then, add in the coconut solids from the first half of the coconut milk can. Season with salt and pepper and cook about 2 minutes until bubbling. Then, add in the rest of the coconut milk (the oil). Lower to a simmer and add in the cauliflower. Cook the mixture for 10 minutes and then add in the lime juice and carrot noodles and cook for another 5 minutes or until carrot noodles soften to al dente. Juice of half a lime! Thanks for catching it! It looks wonderful, thank you. Is the fat content listed correct? Yes, the high fat content comes from the coconut milk! Having trouble using "save recipe" button. Gives me a 404 not found error. I've tried the starfrit spiral slicer and absolutely love it. I purchased it at Walmart and have made zucchini pasta several times. This is definitely the way to go to be healthy...... You blog is amazing. Hi Allie! So I'm new to weight watchers, yet I am an avid Spiralizer! Wondering how many points this particular meal would be? I'm thinking of cooking it this evening for dinner. Thanks!